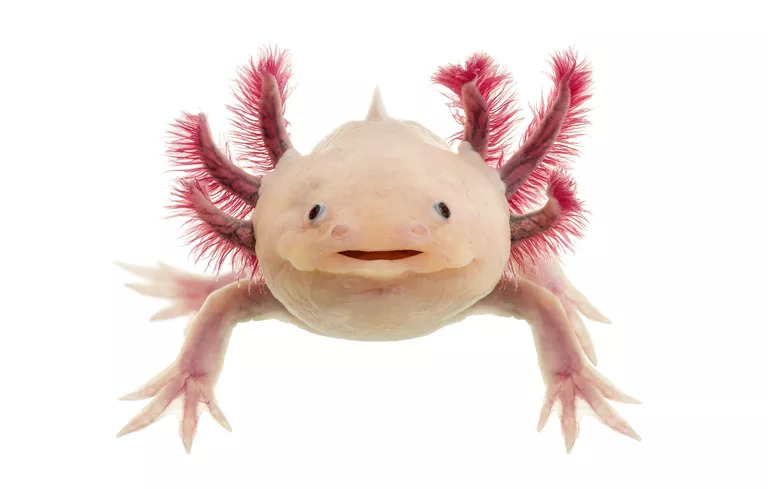 The remarkable axolotl (Ambystoma mexicanum) is part of the family of ‘mole salamanders’, but exhibits an unusual and extreme trait known as neoteny, or paedomorphosis. This is the retention of larval stage characteristics throughout life, so axolotls usually never fully resemble an adult salamander. Unlike other amphibians, most axolotl fail to metamorphose, living permanently in water. Although it does develop lungs, the axolotl’s most bizarre feature is its retention of its branch-like gills. These are external projections from the neck on each side of the head. Each side has three branches covered with feathery filaments which increase the surface area for gas exchange. The axolotl has a long, slim and darkly coloured body, and short legs, with four digits on the front feet and five digits on the hind feet. Albino individuals have been bred in captivity, but are not known to live in the wild. The feature of the salamander that attracts most attention is its healing ability: the axolotl does not heal by scarring and is capable of the regeneration of entire lost appendages in a period of months, and, in certain cases, more vital structures. Some have indeed been found restoring the less vital parts of their brains. They can also readily accept transplants from other individuals, including eyes and parts of the brain—restoring these alien organs to full functionality. In some cases, axolotls have been known to repair a damaged limb, as well as regenerating an additional one, ending up with an extra appendage that makes them attractive to pet owners as a novelty. In metamorphosed individuals, however, the ability to regenerate is greatly diminished. The axolotl is therefore used as a model for the development of limbs in vertebrates.